Sector 9 is a skateboard company that was founded in the backyard of a house in La Jolia, California in 1993 and is currently headquartered in San Diego, California. Sector 9 was purchased in 2008 and is now a subsidiary of Billabong International that specializes in longboards for skateboarding as well as snowboarding and surfing. They sponsor several big names in skateboarding, such as Joel Tudor, Gavin Beschen and Mike Morrissey among others. Sector 9, starting as a simple company that was manufacturing skateboards in the back yard has since then grown into becoming one of the most influential companies in the world of longboard skateboarding. 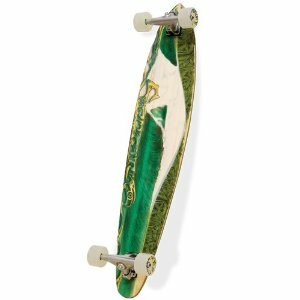 The Sector 9 Green Bush Longboard is a very nice bamboo longboard that is part of the Sector 9 “Bamboo Series.” The ride is very fast and smooth, and the board is absolutely gorgeous. Unlike other bamboo longboard decks I have seen, this one actually looks like a lot of thought and craft was put into the design rather than just “hey, let’s make a deck out of bamboo that will help us shift a few more units.” All you have to do for an example of this is to take a look at the Sector 9 Green Bush Longboard and then look at one of the longboard offerings in bamboo from Santa Cruz Skateboards. Santa Cruz also makes a fine deck to be sure, but the worksmanship on the Sector 9 Green Bush Longboard makes their offerings look incredibly cynical by comparison. The board has a nice concave curve to it, and at 42” long, some very nice length that will give you great, deep carves. The Nineball 70mm wheels are also quality. Big and thick so sticks, cracks and pebbles will not slow you down, and a lot more solid than I am used to seeing come with complete skateboard sets. Be aware though that the wheels you get may vary as far as color selection goes. There have been reports of people getting clear wheels with it and others receiving yellow Nineball wheels. Aside from the personal color preference, the quality of the wheels remains the same. The Gullwing trucks and ABEC5 PDP bearings worked really well, and the ride was fast and smooth, and provided no problems at all getting some really deep carves. 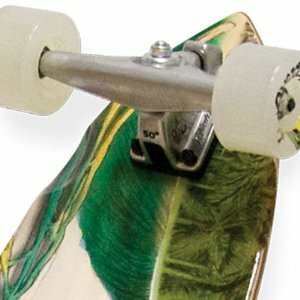 With most complete skateboards, usually there is at least one thing you will want to change on it, be it the trucks, wheels or at least the bearings, but on the Sector 9 Green Bush Longboard, there were no such issues. It was ready to ride right out of the box, which was a very pleasant surprise. Sector 9 has once again proven why they are such an influential company in the world of longboard skateboarding with the Sector 9 Green Bush Longboard. Currently priced at $162.98 on Amazon this board is in the higher price range of longboards however the quality more than justifies the price in my opinion. This entry was posted in Reviews, Sector 9, Skateboarding, Skateboards and tagged Sector 9, Skateboard. Bookmark the permalink.